Luis Antonio Landa Burgos, the state prosecutor leading the case, said he will extend his investigation to include new witnesses and that it must be completed within three months. 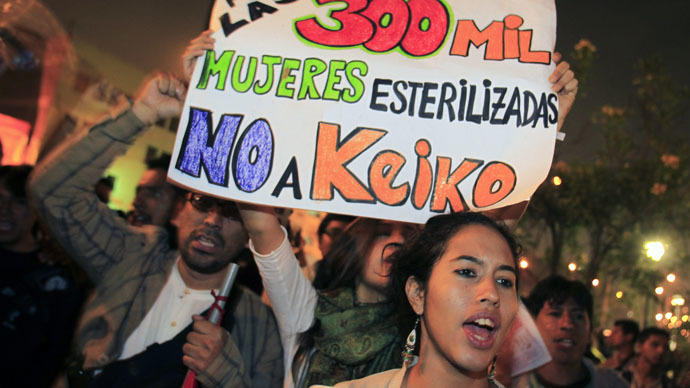 Focusing mostly on indigenous and poor people in rural areas, the sterilization program was led by President Fujimori’s government, who was in power between 1990 and 2000. Fujimori himself has been serving a 25-year jail term since 2007 for human rights abuses and corruption. Most of the victims were deceived, threatened or operated on without them even knowing, according to the rights group. The reported methods used by the authorities were not systematic. In some cases a signature of a relative was used to go ahead with an operation, in other cases victims were operated on secretly after giving birth. Human rights groups filed a complaint against the authorities in January 2014 after finding out that the investigation into the program had been closed after clearing the government of any wrongdoing. This is despite the rights groups receiving statements from 2,073 women, while 18 fatalities were recorded by activists from what they believe was the often secretive and slap dash surgery involved in the process. One of Peru’s top state prosecutors said on April 29 that the enquiry will be widened to include oral statements from more alleged victims in other areas of the country. The Peruvian feminist organization DEMUS, one of several rights groups that had filed the complaint, welcomed the move. "We've waited long enough for the government to investigate these 2,073 cases and hold ex-President Fujimori and his administration accountable for these reproductive rights abuses," Maria Cedano, head of DEMUS, told Reuters on Thursday. It is unclear if Fujimori and his former officials can be charged with any crimes, although they are expected to come under close scrutiny when the probe continues. "There's no specific statement in the notice that the investigation will look into them, but prosecutors have the obligation to investigate the contextual element, to see if there was a state policy for the forced sterilizations, involving the <…> the president and the ministry of health," said Monica Arango, a lawyer and director for Latin America and the Caribbean at the Center for Reproductive Rights. Current President Ollanta Humala said he would investigate the forced sterilizations as part of his election campaign against Keiko Fujimori the daughter of the former dictator. However, after his victory in 2011 progress in the investigation has been slow.